Woods and Jimmy start things off and Jimmy with a flying forearm and then he is sent to the apron but Jey makes the tag and he punches Woods and they hit a double kick to the head for a near fall. Big E tags in and he hits an overhead belly-to-belly suplex. Woods tags in and he gets Big E on his shoulders for a wheelbarrow splash and Woods gets a near fall. Woods with kicks and then he tags in Big E and he kicks Jey. Woods tags back in and kicks Jey and then Woods is Irish whipped to Jey for a baseball slide. Woods with a punch and they return to the ring. Woods gets a near fall and then he hits a double sledge to the back. Woods with punches but Jey punches back. Woods with a kick and he sends Jey into the turnbuckles. Big E tags in and he hits a running shoulder into the turnbuckles. Woods with a gutbuster from a fireman’s carry position and Big E gets a near fall. Big E with an abdominal stretch. Jey with an elbow and head butts to get out of the hold. Big E with an uppercut and he gets a near fall. Big E with a Warrior Splash for a near fall. Woods tags back in and he hits an elbow drop from the turnbuckles for a near fall. Woods with a waist lock. Jey gets to the ropes but it is in the New Day’s corner and Big E tags back in and he hits a belly-to-belly suplex for a near fall. Big E goes to the apron for a splash to Jey but Big E takes too much time and Jey moves as Big E falls to the floor. Woods and Jimmy tag in and Jimmy with punches and a super kick followed by an uppercut. Jimmy with an enzuigiri to Big E and then he sends Woods to the floor. Jimmy with a plancha onto Big E. Jimmy stops Woods. Woods with an elbow and he tries for the Honor Roll but Jimmy counters into a Samoan drop and he gets a near fall. Jey tags in and they wait for Woods to get up and Woods with a DDT to Jey. Big E with a spear through the ropes on Jimmy. Woods with a leg drop for a near fall on Jey. Woods pulls off Jey’s shirt to work on the injured ribs. Woods with another punch to the midsection. Jey with a forearm and Woods with a forearm of his own. Jey with a running forearm of his own. Woods with a punch to the midsection when Jey charges at him. Woods puts Jey in the ropes and Woods goes for the hesitation drop kick but Jey gets up and hits a super kick. Big E makes the tag and Woods with a lungblower while Big E hits a UranagE but Jey kicks out at two. Big E tags in Woods and they set for Midnight Hour but The Usos with a double super kick. Jey with a rollup on Woods for a near fall after Woods hits a missile drop kick on Jimmy. Jimmy with a super kick and Jey tags in and he hits a frog splash for the three count. 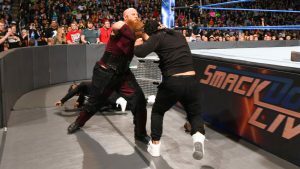 After the match, the new Smackdown Tag Team Champions, Erick Rowan and Luke Harper make their way to the stage and they point their Bludgeon Hammers at The Usos. The Usos’ long-awaited WrestleMania moment turned into a coronation for The Bludgeon Brothers. Now, Jimmy & Jey are coming to set things straight. The twin high-flyers will challenge Harper & Rowan at the Greatest Royal Rumble event in Saudi Arabia in a last-ditch effort to combat The Bludgeon Brothers’ recent, unstoppable ascent to the top of SmackDown’s Tag Team division. Harper & Rowan went from dark-horse contenders to two-man wrecking crew in the span of a month. 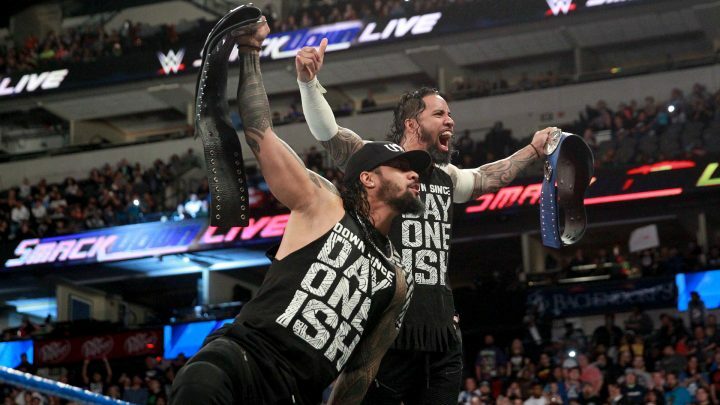 They went from crashing an Usos-New Day title match and wreaking havoc at WWE Fastlane to obliterating both teams in a Triple Threat Match at WrestleMania, earning their first reign as SmackDown Tag Team Champions in the process. 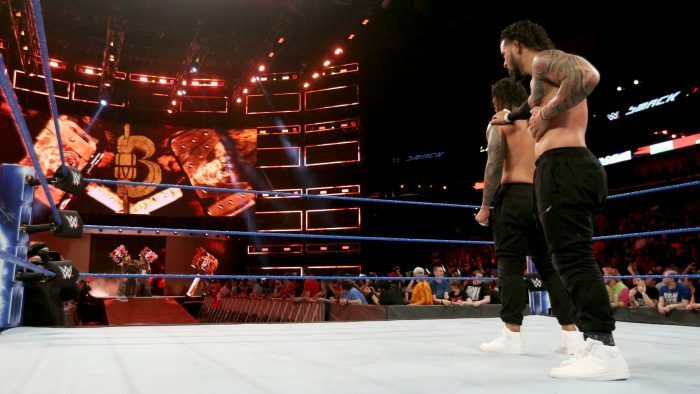 The Usos, whose fight to finally compete at WrestleMania was well-documented, would not be so easily cast aside, however. 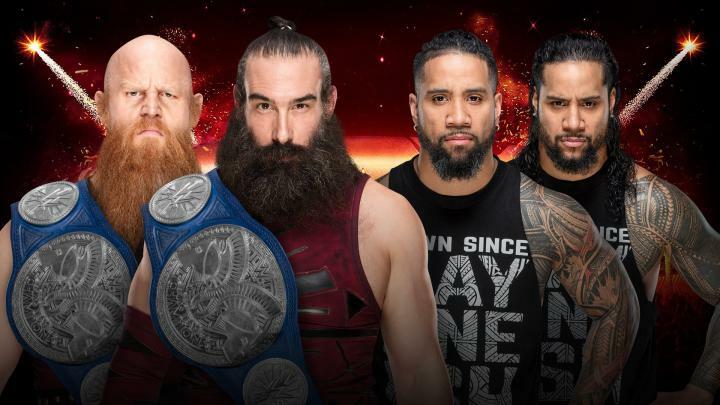 After defeating The New Day on SmackDown LIVE to earn the right to challenge The Bludgeon Brothers, they go to Saudi Arabia with payback on their minds and the hope that it will be Day One all over again when they return stateside. Tune in to the Greatest Royal Rumble event to see which team leaves as SmackDown Tag Team Champions on Friday, April 27, at 7 a.m. AST. The event streams live on the award-winning WWE Network with a tune-in time of 12 p.m. ET/9 a.m. PT, with a special, one-hour Greatest Royal Rumble Kickoff starting at 11 a.m. ET/8 a.m. PT. It will be available on pay-per-view outside of the Middle East with regional broadcast information forthcoming, and tickets will be available Friday, April 13. Woods with a plancha onto Harper on the floor. He avoids Rowan and then hits a thrust kick on Harper followed by a kick and forearm in the corner. Big E tags in and hits a running shoulder. Big E punches Harper and Woods punches him from the turnbuckles. Woods with punches and then Woods is Irish whipped towards Harper but Harper with a drop kick. Rowan tags in and hits a splash for a near fall. Rowan sets for a pump handle back breaker and hits it. Rowan with an elbow drop and knee drop. Harper tags in and he hits a sliding forearm to the back. Harper kicks Woods and chops him. Harper with an Irish whip but he runs into a super kick and Woods follows with a forearm. Rowan sends Kofi into Big E to prevent Woods from making the tag. Woods sends Big E into the ringside barrier and apron. Harper with a clothesline to Woods. Rowan gets the mallets but the Usos attack Harper and Rowan. After the match, The New Day take care of Harper and Rowan. The New Day and Usos argue in the ring and Harper and Rowan get their Bludgeoning Hammers but the New Day escape. The championship match first came about when The New Day won the right to once again challenge The Usos for the titles at WWE Fastlane. As that rivalry began to regain steam, Harper & Rowan waited in the wings until they finally struck during the edge-of-your-seat title bout, decimating both teams and sending Xavier Woods to the hospital. 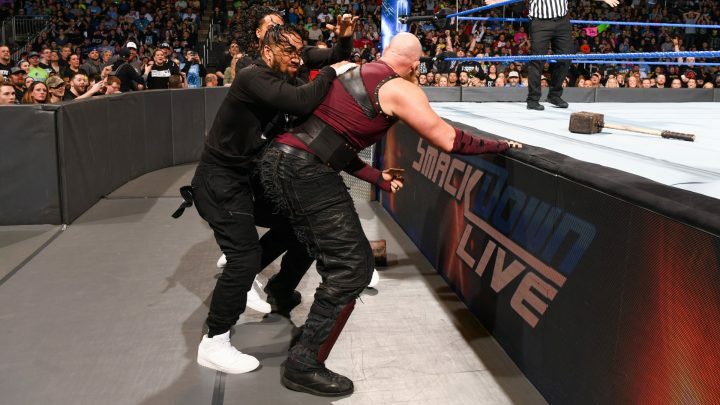 The Bludgeon Brothers continued their onslaught the next week, defeating the only medically cleared members of The Usos and New Day — Jimmy Uso and Big E — and using brute strength to position themselves for a title match. Tune in to WrestleMania to see who leaves as SmackDown Tag Team Champions, streaming live Sunday, April 8, on the award-winning WWE Network at a special start time of 7 ET/5 PT! We are back and the Usos make their way to the ring. Jimmy says at Fastlane it was Usos versus New Day to battle over the Smackdown tag titles. Jey says it was one of the hottest rivalries renewed and they put on a classic. The winner goes to Wrestlemania as tag team champions. Jimmy says until the Bludgeon Brothers got involved. They were not after the tag titles, they were there to hurt them. Jimmy says that Jey is still banged up. Jey says they are still here. Jey says they are holding down this tag division and they show their titles. Jimmy tells the Bludgeon Brothers they don’t know how to back down. Jey says they only know how to go hard and be the best tag team the WWE has ever seen. Jimmy says they are not just going to stand there and let people take their chance at being on Wrestlemania. Jimmy says they are going to war tonight. Jey says it does not matter if they are at 100 percent or not, it is on lockdown when you get in the ring. Jimmy slowly goes to the floor before locking up. Luke follows and Rowan follows Luke. Jimmy gets back into the ring and he knocks Luke off the apron with a forearm. Luke stops a suicide dive attempt with a forearm and he sends Jimmy to the floor and then he sends Jimmy into the announce table. They return to the ring and Harper with a punch and he chokes Jimmy. Harper with chops. Jimmy with a punch and chops. Harper with an Irish whip and uppercut. Harper with a chop and a running forearm into the corner. Jimmy goes down when Harper goes for a cross body into the corner and Harper goes over the top rope to the floor. Jimmy with a drop toe hold that sends Harper into the matrix board. Jimmy is frozen by Rowan on the apron. Harper is sent into Rowan and he is knocked off the apron. Jey hits Harper and Jimmy gets a near fall. Harper with a thrust kick and he sets for a power bomb but Jimmy gets to his feet. Jimmy with a kick but Harper with a thrust kick to crotch Jimmy and then he sends Jimmy into the top of the ring post. Harper with a discus clothesline for the three count. 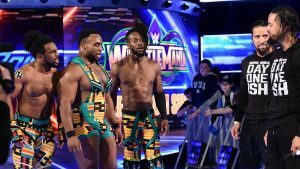 Introduction: After suffering a brutal attack at the hands Harper & Rowan on Sunday night at WWE Fastlane, Jimmy Uso and Big E, the only two medically cleared members of The Usos and The New Day, teamed up to seek a measure of retribution against The Bludgeon Brothers on SmackDown LIVE. Backstage Interview: Big E walks in the back and he is asked about the challenge by the Bludgeon Brothers. Big E says he wishes he could say that they proved everyone wrong and won the tag titles. He wishes he was here with his brothers but he cannot. The Bludgeon Brothers tried to destroy them. Kofi and Woods will be back. Big E says he will represent The New Day. Jimmy Uso shows up and he says Big E will not be standing alone. Before the Bludgeon Brothers interfered, they had a classic and they will meet again when they heal up. Jimmy and Big E walk together as we go to commercial. Big E and Jimmy attack Harper and Rowan as they take off their jackets. They send Harper and Rowan into the ringside barrier. Jimmy and Big E get chairs. Harper and Rowan pick up their mallets. They enter the ring and the referee leaves. Rowan hits Jimmy’s chair and then Harper misses Big E.
We are back and the match is started and Big E with shoulders to Harper in the corner but Harper with a Bossman Slam. Rowan tags in and he hits a splash with help from Harper. Rowan kicks Big E in the corner and then he slams Big E. Rowan walks across Big E’s chest and tags in Harper. Harper kicks Big E in the chest. Harper with chops to Big E but Big E with an elbow and he tags in Jimmy. Jimmy leaps over Harper and connects with an uppercut and a flying forearm. Uso with a thrust kick and uppercut. Harper blocks a super kick and Uso with a kick and corkscrew splash. Jimmy knocks Rowan off the apron. Harper with a running boot and he sends Big E to the floor. Rowan sends Big E into the ring steps. Rowan tags in and Rowan with a splash to teh back and then they hit a spike power bomb for the three count. 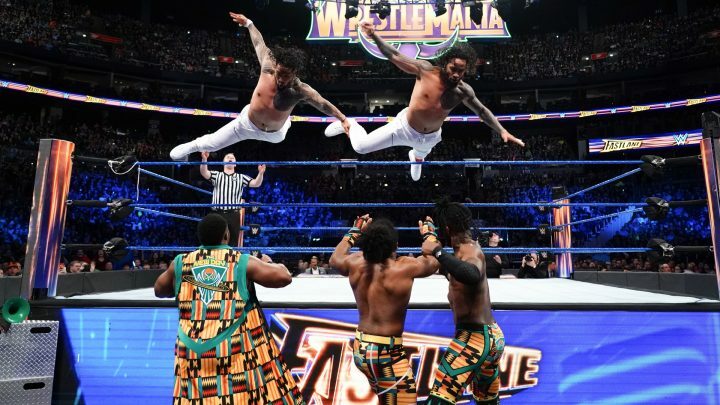 Introduction: The Usos and The New Day have had some of the most explosive matches in tag team history. These teams have gone through Hell and back to remain the top tag team. Can The Usos hold on to the SmackDown Live Tag Team Championships, or will The New Day catch up with The Usos and become Five time champs? One team has never won at WrestleMania. The other has never made a WrestleMania. And a third team isn’t about to be left behind on The Road to WrestleMania so easily. 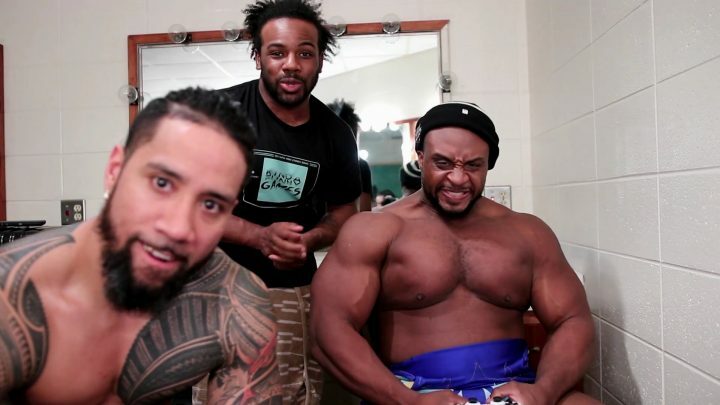 The long-awaited, rivalry-renewing clash between The Usos and The New Day ended in indecisive fashion when The Bludgeon Brothers came calling and put a brutal end to what had been shaping up to be among the most unpredictable of the instant classics between ya boys and the Day One twins. 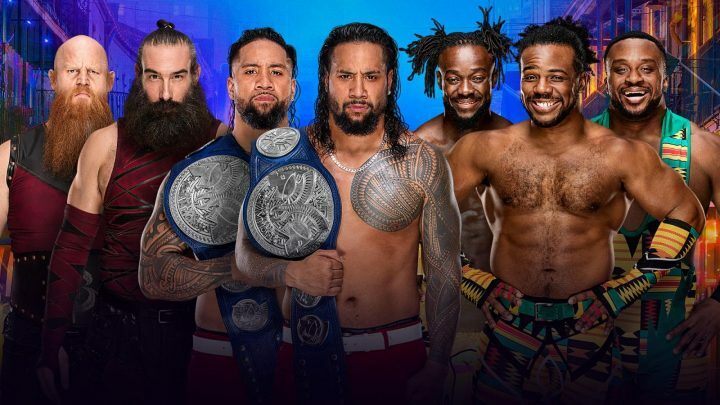 Match Summary: WWE Smackdown Tag Team champions The Usos vs. The New Day. Xavier Woods started off with Jey Uso. He got drilled hard early and The Usos cornered him and tagged in and out, stomping him hard. Corey Graves referenced the Samoan SWAT Team. I popped for that. Xavier finally tagged out to Kofi Kingston, who nailed a lot of hot offensive maneuvers before nailing the Boom Drop. Lots of really good back and forth action. Kingston was worked over but made the tag to Xavier. Xavier fired back with roaring forearms. Kingston added a kick, setting up Jimmy Uso for a Woods superkick. Kofi tagged in and went to the top. Xavier nailed a superkick and Kofi nailed a superfly splash for a two count. New Day were sent to the outside, setting up a double dive from the Usos onto all three members of New Day. The Bludgeon Brothers’ music hit, and they came down to the ring. They attacked everyone on the floor, so the referee rang the bell. I get they are obviously setting up Wrestlemania but given the level of work those involved could pull out in the ring, this was disappointing to see. The Brothers pulled Woods off the apron and suplexed him down to the floor. 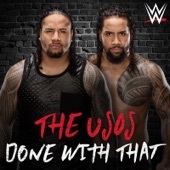 They ran the Usos into each other, then slammed them on the floor. Harper slammed Harper atop of one of the Usos and then splashed the champions. They then powerbombed Woods on the bottom half of the ring steps. Everyone was left destroyed by the Bludgeon Brothers. As a vehicle to get them over, it was very effective. One would assume a three-way bout at Wrestlemania. They promoted the Roman Reigns vs. Brock Lesnar storyline leading into Wrestlemania. AJ Styles was being interviewed by Renee Young when Shinsuke Nakamura showed up. Nakamura told him he hoped that AJ won tonight so he could beat AJ. An intense AJ cut him off and warned him that at Wrestlemania, Nakamura was who was going to get beat. They stretchered out all of the Bludgeon Brothers’ victims.